Distribution: Although blennies can be found in lower shore pools, they are common in the sea below the low tide level. It is a tropical species found on reefs in the Western Pacific: Queensland from Cape York Peninsula at 12°S to the Bunker Group, southern Great Barrier Reef. Description: This harmless species grows to a maximum size of 7.5 cm. Instead of scales, it is protected by slime. The Queensland blenny enjoys digging and jumping and is a herbivore. They are characterized by elongated, tapering bodies and a continuous long dorsal fin. 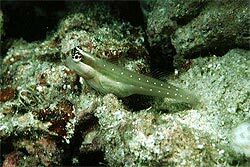 Interesting facts: The male blenny attracts a female with a courtship display to a nest site. The male then attends the eggs until they hatch. Some species may range to depths of about 450 m.